At the store we just see the red heart in the center, but in the field we see the other leafy material that is part radicchio, too. The outer leaves, which are green, often lie open, the purple ones next tier in that are also somewhat opened, then finally there’s the tighter purple-red head in the center, looking something like a cabbage, only smaller. 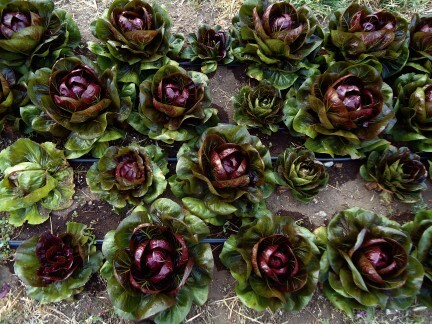 Radicchio, however, is not a cabbage, but a chicory, closer kin to lettuce, Jerusalem artichokes, and salsify —all members of the daisy, or aster family, Asteraceae. All of the plants in this family produce flowers that are daisy like in form. During the summer radicchio doesn’t look so interesting in my garden, but the minute the weather turns cool, it starts to turn that seductive dark purple red that makes it irresistible. As dramatic as radicchio is in a salad, I adore it when it’s seared in a skillet and covered with Gorgonzola or another blue cheese. As it’s color fades to brown, its flavor swells and sweetens. I add the cheese once the wedges have been turned then let it Oakley Sunglasses cheap soften and ooze into the leaves. Freshly cracked pepper finishes the dish and maybe a little splash of aged red wine vinegar. It’s the winter food I eat often and adore each time I do. Cut the radicchio into 6 or 8 wedges, keeping them joined at the base so they don’t fall apart. But even if they do, don’t hesitate to use them. Coat a cast iron skillet or grill pan with olive oil. When the oil is hot, add the wedges of radicchio and season with them with salt. With the pan being hot but the heat only medium-high, cook until the wedges are browned on the bottom, then turn, adding a little more oil if needed and another few http://www.oakleyonorder.com/ pinches of salt. Lay the cheese over the top, season with freshly ground pepper, and cover the pan. Cook until the leaves are browned all the way through and the cheese has softened, a matter of a few minutes. Remove to a plate and eat as is, or with a dash of vinegar. You can eat this over polenta, too, or with pasta, and it’s delicious paired with roasted winter squash. Actually, Ali, that sounds like a great idea! I think I’ll try it. Oh this is gorgeous….! Can’t wait to make it! But don’t forget! It won’t be gorgeous when you cook it. Just good. Heat and fat do wonders for all kinds of things, no? Deborah, you could make anything sound delicious. You’ve got me searching for a seed source so I can try this next fall.